You bring the feet, and we bring the plans. Hard Rock Cafe is a chain of American restaurants his decoration worship the rock. This restaurants it’s around the world. In Madrid it’s a popular place and it’s frecuent for very much people. The peple in Madrid, we like to spend time there is a place to enjoy and have a good time and in good company. 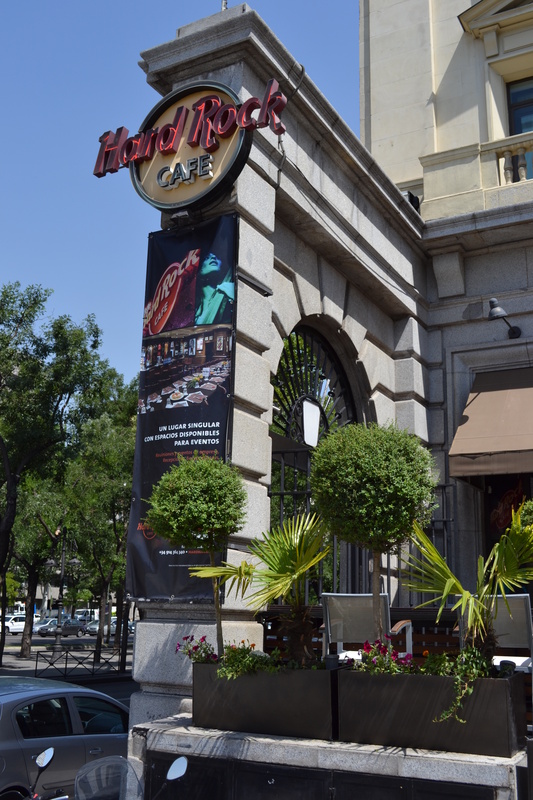 The Hard Rock Café that we usually go is located at Plaza de Colón, next to the historic Paseo de la Castellana and near the National Library. Also since September, began a new period with very fun activities, to enjoy the best international cuisine in the best environment. A new feature, which was the one we liked when we visited the site this year is that every Wednesday from 23.00 hours “Music a la Carte”. While you have a dinner, you can choose from over 150 songs that offer what they call ” rock chart ” and local band (two guitars and drums) touch it for you. People are encouraged and sings too. It’s great fun! In this are organized concerts and popular events in this great city. Please tell us what you think and give us your opinion! They have great food, music and a friendly environment! They have also a terrace that is very nice in summer (avaliable during cold season but i don´t think is a good idea hahaha)Is it the only one here in Madrid? Thanks! It sounds like a great place; I will definitely have to visit it soon, perhaps Wednesday is a good day to go! It would have been nice if you put some videos of the band playing live, or pictures of some tasty dishes we could order; we are interested in your suggestions, as regular clients… Maybe we even meet there some time!